The near complete hive enclosure in the orchard. So here we are, our first article to grace the Vyne’s gardens web/blog. As a keen volunteer and gardener I’ve gotten involved in many projects over the past 10 months working in the National Trust. 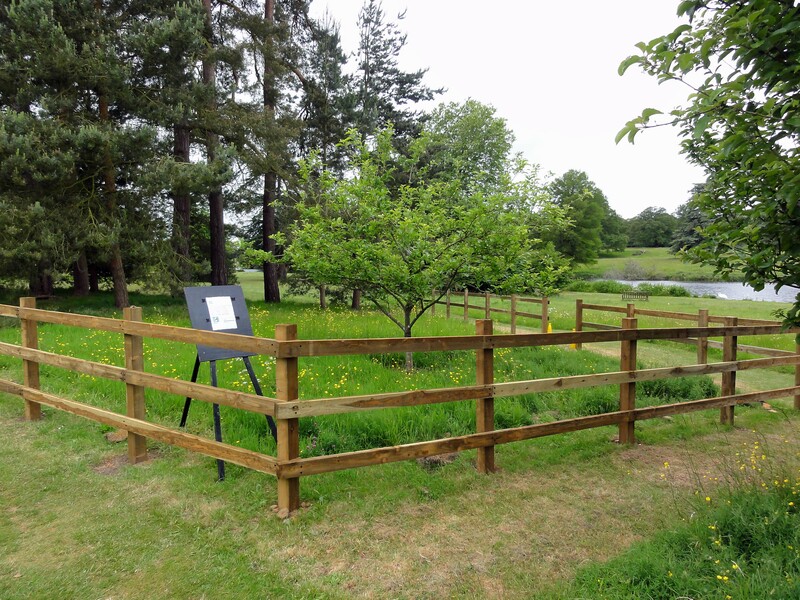 Just recently I have been given the opportunity to assist in building a very robust fenced area within the orchard. Work started around a month ago and is now almost complete. Joking aside, I have found all the gardening team to be an amiable, fun and above all good humoured bunch of people to work with. I have learnt much during the time I have spent with them and they are always eager to share their experience and knowledge with others. During our excavations the gardeners have unearthed one or two fragments of 18th century glass and earthenware which has now been handed over to our property conservationist to record. Getting back to the subject of this post. It feels satisfying to step back and see this stage of the project completed to a high standard and knowing that it will be around for a good many years for the public to enjoy. The decision to have the hives located in an area where the public get to see first hand what we are doing to encourage wildlife into the gardens is great. I have no doubt It will foster interest in bee keeping too, especially those with curious minds. Please do ask questions. You may notice that inside the fenced area there is what appears to be a mesh windbreak approximately 6 foot high. This is where the hives will sit. The idea being that when the bees exit from the hives they will be directed upwards into the trees and away from our visitors as they go about the normal course of business, i.e. collecting nectar from the surrounding area. With the area now fully prepared, we have a two week wait until the first of the bees arrive late this month. The plan is for four hives which will be brought in over a period of eight weeks or so depending on various factors. The weather, bee condition/health and various other considerations known only to the Apiarist at his point. I’m very much looking forward to meeting and working with the bee keepers, not least because I’d love to better understand what’s involved at many levels. Conservation, husbandry, how the hive works and the process that ends with that first taste of pure natural honey. Over the coming weeks and months we will continue to bring you updates as the project develops. The short and long term plans are number one, educational. Bee populations around the world are in decline, the more we understand the complex world of bees the better chance we have of increasing their population so they continue to play their key role in pollination. Maybe you would like to keep bees where you live. If so please subscribe to this blog topic and tell your friends about it. Number two, looking long term, perhaps next year, to produce our very own Vyne honey for visitors to purchase. There is nothing quite like wild natural honey. I’ve tried some produced from the hives at Cliveden gardens in Berkshire and it tastes glorious.